Microsoft has finally brought the much requested extensions support for Edge browser with the Insider Preview build 14291. Users who are on build 14291 or above can now add new features and capabilities to Edge browser by installing extensions. While limited number of extensions available for now, you can expect to see hundreds of extensions in the next few months. Installing an extension in Edge browser is fairly easy. You need to click the More (… icon), click Extensions, click Get extensions, and download an extension to your PC. The downloaded extension needs to be unpacked by double-clicking on it. Finally, after navigating to Extensions section in Edge browser, you need to click Load extensions, select the extension that you want to load, and then click Load button to begin using the extension. At times, while installing an extension in Edge browser, you might get We couldn’t load this extension error. The error appears when the Edge is unable to load a selected extension because of a missing or corrupted file. If you’re also getting “We couldn’t load this extension” error, you can follow the given below directions to install the extension without the error. 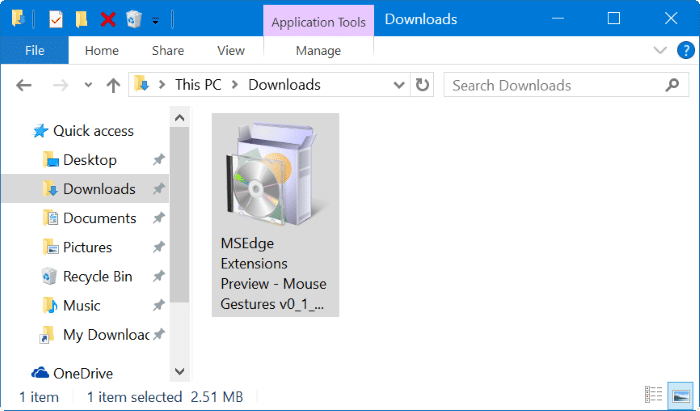 When you unpack a downloaded extension by double-clicking on it or clicking Run button in the Edge browser, the self-extracting pack automatically creates a folder of the extension. If you’re getting “We couldn’t load this extension” error, please delete the extension’s folder that you’re unable to install. Once the folder is deleted, double-click on the extension’s file to get a fresh copy of extension’s folder. You should now be able to load the extension without the error. The error “We couldn’t load this extension” appears when one or more files of an extension are corrupted or missing. So it’s a good idea to delete downloaded extension’s file, and download a fresh copy of the same if the error persists even after following the directions mentioned in Method 1.